Please note that the content of this book primarily consists of articles available from Wikipedia or other free sources online. 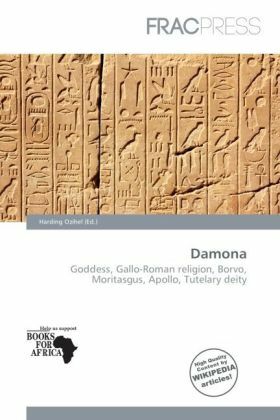 In Gallo-Roman religion, Damona was a goddess worshipped in Gaul as the consort of Apollo Borvo and of Apollo Moritasgus. Mary Jones interprets Damona's name as "Divine Cow" based on its resemblance to damos or "cow". She has sometimes been linked with the Irish goddess Boand on the basis of this bovine association. Van Andringa describes Damona and Bormana as the patron deities of the hot springs at Bourbonne-les-Bains and Saint-Vulbas, respectively. Some seventeen inscriptions dedicated to Damona have been recovered, including nine from Bourbonne-les-Bains and four from Bourbon-Lancy, both spa towns in eastern France. In one inscription from Saintes, she has the epithet Matubergini.